The reality mogul took to Twitter to defend her 41-year-old husband after he found himself embroiled in yet another controversy for seemingly giving R Kelly's music the okay. Kim claimed Kanye's recent statements were 'taken out of context' in a series of tweets yesterday. 'I want to make it very clear, he is not condoning anyone’s actions or unacceptable disgusting behavior,' Kim wrote. It was during a recent video that Kris Jenner livestreamed from Yeezus' Sunday Service, that Kanye made the questionable comments. 'They just gonna pull up full documentaries on him. Then they gonna come with the Michael [Jackson] documentary,' Ye said in the video. Many took his statement about 'documentaries on him' to be in reference to Lifetime's Surviving R. Kelly docuseries which revisited the 52-year-old's sordid history of sexual assault allegations. It was that particular sentence that many on social media took offense to. 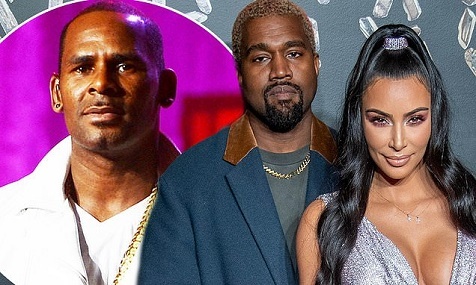 A full clip of the service obtained by TMZ showed that Kanye never mentioned R Kelly and spoke nearly the entire time about himself. As the public caught wind of the controversial comments wife Kim quickly came to his defense with her tweets. 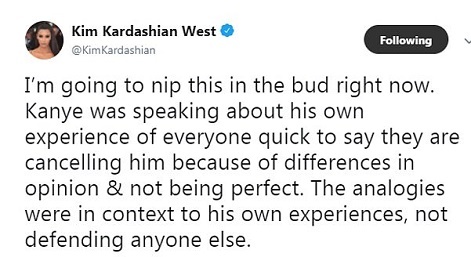 While some of Kim's fans were supportive of her defending her man, others were surprised it wasn't Kanye making the clarification. One day she would get tired with the constant explanations of his tweets.